As part of our ongoing mission this term to let students know we care, we have been using some essential oils to help students relax today! Aromatherapy has been around for a long time, for example in China and Egypt, where oil and incense have been used for up to 6000 years. A recent study by Lee Redstone, published by the Archives of Psychiatric Nursing, has shown that essential oils can enhance mindfulness therapy by reducing stress and anxiety levels. We hope that students felt the effects of our soothing blend of Lavender and Eucalyptus oil today – hopefully they had more luck smelling it than this statue from our collections would! 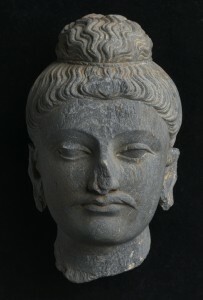 Gandharan sculpture fragment: Head of Buddha, 1st century, EU1343. See it here. We will be popping up regularly next week during revision time and in the exam period following that. We have organised some very exciting events to help students relax, and also plan to celebrate a certain someone’s very special 400th birthday, so keep an eye on Facebook and Twitter! Also look out for our table in the Main Library Foyer, which will have aromatherapy as well as mindfulness activities for students to try! Remember, your library loves you! This entry was posted in Collections, Interns, Library and tagged happylibrary on April 13, 2016 by universitycollectionsvolunteers.